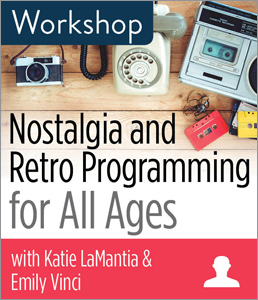 CHICAGO—ALA Publishing eLearning Solutions announces an exciting new workshop, Nostalgia and Retro Programming for All Ages with Katie LaMantia and Emily Vinci. This workshop will last 90 minutes and take place at 2:30pm Eastern/1:30 Central/12:30 Mountain/11:30am Pacific on Monday, May 6, 2019. Everything old is new again—the retro trend is everywhere, including in libraries. We love the 90s (and 70s and 80s), and chances are your patrons do too! In this new workshop, library programming experts Emily Vinci and Katie LaMantia show you how to engage with patrons of all ages and bring dynamic programs from the past back into the library with flair. You’ll get over fifteen programming ideas and activities for all age groups and budgets and learn how to incorporate your own personal nostalgic interests into programming, marketing, and partnerships to create programming tailored to your library and patrons. Whether you want to run a tubular 80’s ski program or turn your all-purpose room into a disco, there’s something for everyone in the past. Registration for this workshop can also be purchased as a part of the Library Programming for All Ages, Stages, and Sizes Workshop Bundle.